Colds and illnesses are an unfortunate but necessary part of childhood. From infancy to adulthood, a child’s immune system is constantly faced with new bacterium and viruses that it must build immunities against. One of the most common bacterial or viral infections young children will experience is sinusitis, which causes one or more of the sinuses to become inflamed, resulting in fever, cough, yellow or green nasal discharge, facial pain, congestion and swelling around the eyes. This painful inflammation may sound similar to a common cold, but if the symptoms last longer than a week, sinusitis treatment may be necessary. Sinusitis in children can be treated with decongestants, nasal sprays or antibiotics, but more often than not, simply alleviating the symptoms is the best course of action until the sinusitis clears up. If you are concerned that your son or daughter may be suffering from sinusitis, do not hesitate to contact Pediatric ENT Associates in Birmingham today for an accurate diagnosis, guidance and sinus infection treatment. There is a wide range of factors that can trigger sinusitis in children, but it is important to note the symptoms of sinusitis are very similar to a common cold. What differentiates sinusitis is the symptoms will persist for seven to 10 days without improvement. A common cold will gradually go away during that same time period. Additionally, children younger than six or seven have not developed frontal and sphenoid sinuses and, therefore, are less susceptible to sinusitis. A common cold or respiratory infection is the most likely cause of sinusitis in children and adults. Young children are more susceptible to colds and other illnesses due to their weak immune systems. As a result of most common illnesses, the lining of the sinuses become swollen and trap mucus and infectious bacteria, which then infects the sinuses. Environmental factors such as pollen, pollution, and cigarette smoke can irritate a child’s sinuses, leading to allergic reactions such as a runny or itchy nose, postnasal drip, sneezing and nasal blockage. Hay fever, in particular, is one of the most common childhood allergies that may lead to sinusitis and even ear infections. Air pollutants can also damage the cilia in the nasal canals, which help move mucus through the sinuses, resulting in the higher likelihood of a child’s sinus infection. Children in Alabama can also develop sinusitis as a result of swimming lessons and spending the summer swimming in pools or natural bodies of water. It is not uncommon for chlorinated or unsanitary water to be forced into a child’s nose and sinuses as a result of diving and playing in the water. Children can also be at risk around indoor swimming pools that do not have enough ventilation, as the chlorine in the air can irritate the sinuses. Adenoids are located at the back of the throat near the nasal passage that helps catch bacteria and viruses that may enter the body when eating or breathing. This tissue may become inflamed in order to destroy harmful bacteria or viruses. However, the swollen tissue can also block mucous in the sinuses, which can quickly lead to infection. The adenoids are particularly important for fighting infections in babies and young children, and gradually shrink as a child gets older. If the adenoids frequently become enlarged or infected, it may be necessary to have them removed to prevent chronic sinusitis, sleep apnea, ear infections and difficulty breathing. The nasal septum separates the nose into two separate chambers, but when this cartilage is off-center or crooked, it can result in breathing issues and abnormal nasal discharge. Some children are born with a deviated septum, and others may develop it as a result of an injury or medical treatment. A severely deviated septum can interfere with breathing, contribute to frequent sinus infections and cause sleep apnea, even in very young children. 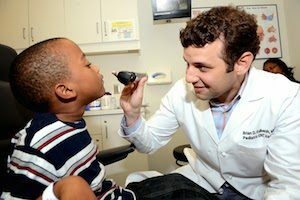 The occasional child sinus infection should clear up through the use of over-the-counter children’s pain relievers, decongestants and prescription antihistamines or antibiotics (for bacterial infections), but a skilled ENT pediatrician must evaluate frequent bouts of children’s sinusitis. Diagnosing the condition and determining the cause can help prevent the sinus infections from recurring, allowing your son or daughter to breath easier. Learn more about sinusitis treatment in children and sinusitis causes at Webmd.com. Schedule Sinusitis Treatment at Children’s of Alabama Today! If your son or daughter is suffering from sinus infections that you would like to have examined or treated, please contact Pediatric ENT Associates at the Children’s of Alabama in Birmingham today. Our board-certified pediatricians are dedicated to helping children overcome a variety of ear, nose and throat conditions such as sinusitis so they can get back on their feet again as quickly as possible. Call us at (205) 831-0101 to schedule a consultation! Next, read about How to Improve Your Child’s Hearing.